Explore wonderful Andalusian landscapes on the waterway: Drive by kayak over the Guadalquivir river to idyllic places in Doñana Natural Park. Meeting point for all guided excursions by kayak on Guadalquivir river is the beach of Sanlucar de Barrameda. In case you have no prior knowledge of kayaking, the guide will of course show you the right and easy-to-learn paddeling technique upfront. After a short introduction by the experienced guide, you'll drive downriver in direction of the Atlantic around Cap Punta de Malandar. If the waves are too high, you instead paddle to the antique fishing harbour or the marshland areas of Doñana Natural Park. Along the way, you'll have fantastic views on the city Sanlucar and the pristine nature of the natural park. The excursion is suitable even for complete beginners, about 4-5 km long and possible during the whole year with the best conditions between March and October. The 6 km long kayak tour is also possible for beginners with a really good fitness and endurance. The tour leads from the old village "La Plancha" always with the current and therefore as effortless as possible through the Doñana Natural Park. You'll drive by kayak on Guadalquivir river, starting close to Huelva and following a saltwater canal along the banks of the beautiful natural park with its great variety of species. This kayak tour is suitable for sporty participants with a really good endurance. The tour leads long the last 17 km of Guadalquivir river. You'll cross the various ecosystems of Doñana Natural Park and an important canal that regulates the water level of the marshlands. With a bit of luck, you'll be able to spot boars, deers, colourful flamingos and many more bird species. The sightseeing kayak tour starts at a minimum of 4 persons, the 6 km long tour with at least 6 participants and the 17 km long tour with a minimum of 10 persons. Once the estuary area of Guadalquivir river was a huge river delta at the Atlantic Ocean: The natural harbour was already a busy trading centre at the Roman times. In the 15th and 16th century, the ships of Christopher Columbus and Ferdinand Magellan startet their voyage of exploration from there. Nowadays there's a almost 100 km long sand bank laying over the historical place. Behind this, one of the biggest natural reserves of Europe is located: the Natural Park Doñana. Where once the famous navigators started their expeditions, you can start your own journey of discovery by kayak. During the whole tour, you'll be able to spot numerous idyllic and special places along the natural park. Depending on the current and weather situation, the sightseeing kayak tour on Guadalquivir leads along three different routes. The route Baluarte de San Salvador leads you past fishing houses of the city part Bajo de Guia to the fishing harbour of Sanlucar-Bonanza. Get to know more about the traditional fishing in Sanlucar and spot a castle from the 17th century along the way. The guide will give you lots of interesting information about the harbour and the fishing methods. A cape in front of Sanlucar is the name giver for the route Punta de Malandar. At this tour, you'll cross the Guadalquivir river and drive along the beach of Doñana. From here you'll have fantastic views over Sanlúcar de Barrameda and some of its sights. With a bit of luck you'll be able to see some deers or boars walking down to the beach. At the route Espíritu Santo you'll be paddling along the riverside where the traditional horse races of Sanlucar take place every summer. On this kayak tour, you can see antic stone hurdles used for simplificating the work in the fishing- and mussel cultivation. At a stop you'll have a gorgeous view over the mouth of the river Guadalquivir and Sanlúcar de Barrameda. Passionate kayakers can also choose two differently long kayak tours in Doñana Natural Park in different length that require a certain fintess level and endurance at kayaking. In case you don't know the paddling technique yet, the guide will of course give you an introduction upfront and show it to you. The tickets we received relatively quickly after booking by e-mail. All necessary information was included. The Kayak Tour really pleased us. The surroundings also. We are beginners and decided to go on a sightseeing tour. It was not a problem. We would have made it even further and the 3 hour tour would certainly not a problem. The guide was good but we would have been happy if he spoke German. Therefore, only 4 out of 5 stars. Otherwise everything was ok. 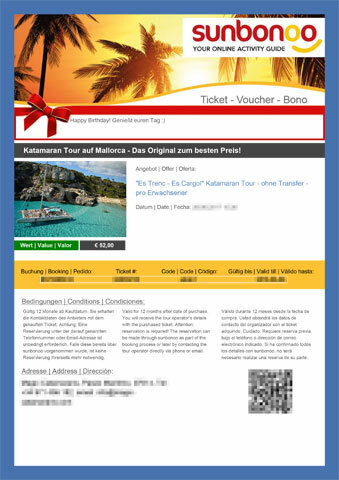 Die Tickets erhielten wir relativ schnell nach der Buchung per E-Mail. Alle notwendigen Infos standen mit dabei. Die Kayak Tour hat uns wirklich gut gefallen. Die Umgebung auch. Wir sind Anfänger und haben uns daher für die Sightseeing Tour entschieden. Es war kein Problem. Wir hätten es auch noch weiter geschafft und die 3stündige Tour wäre sicher kein Problem gewesen. Der Guide war gut aber wir hätten uns gefreut wenn er etwas Deutsch gesprochen hätte. Daher nur 4 von 5 Sternen. Sonst war alles ok.
You're reviewing: Kayak tour through Doñana Natural Park on Guadalquivir river. How do you rate this product?